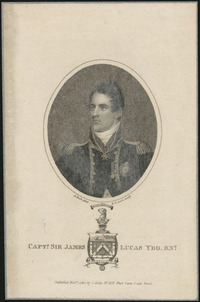 YEO, Sir JAMES LUCAS, naval officer; b. 7 Oct. 1782 in Hampshire, England, elder son of James Yeo, sometime agent victualler to the Royal Navy at Minorca; d. unmarried 21 Aug. 1818 at sea. After a brief schooling at Bishop’s Waltham near Winchester, Hampshire, James Lucas Yeo joined the Royal Navy in March 1793 as a boy volunteer. Promoted lieutenant on 20 Feb. 1797, he was advanced to commander on 21 June 1805 and captain on 19 Dec. 1807, by which time he had already been recognized as an intrepid practitioner of unconventional sea warfare. Typically, he had captured his own first command, the 22-gun French privateer Confiance, during a lightning raid of 4 June 1805 on Muros, a small fortified port on the northwest coast of Spain. At the time of the raid he was first lieutenant on the 46-gun Loire and was in charge of a shore party which was to act against a local fort of unknown strength. In the event, he was required to neutralize a potentially dangerous harbour battery before moving against the fort, which by this time was firing on the Loire. Although he had only 50 men under his command, he stormed the place, which was garrisoned by 250 men and equipped with 12 cannon; this successful assault led to the capture of the Confiance and other substantial prizes. Yeo was promptly appointed to command the Confiance, an action which was as promptly endorsed by the Admiralty. Two years later he achieved the coveted rank of post-captain, a promotion undoubtedly influenced by sterling services to Vice-Admiral Sir William Sidney Smith in the negotiations and effort which led to the successful evacuation of the Portuguese royal family to Brazil in the face of a French invasion of Portugal. In the winter of 1808–9 he led an Anglo-Portuguese expedition against Cayenne, French Guiana. With only 400 men and a few heavy guns he compelled the surrender of a garrison of some 1,200, protected by strong fortifications and more than 200 cannon. This extraordinary feat resulted in the expulsion of the French from South America and won Captain Yeo signal honours: on 17 Aug. 1809 a knight commander’s cross of the Portuguese order of St Benedict of Avis – he was the first Protestant to be so honoured – and, on 20 June 1810, a knighthood. For some months after his return to England he was on half pay, convalescing from a severe bout of malaria, but early in 1811 he was assigned to the 32-gun Southampton and ordered to Jamaica. 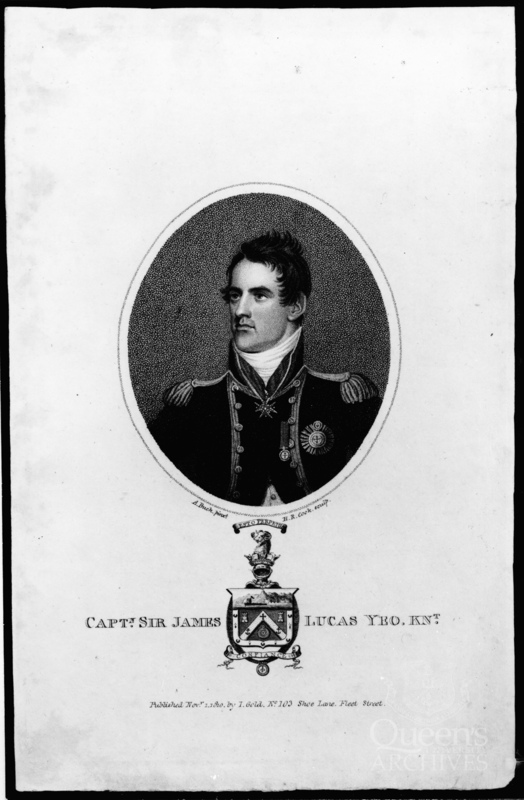 On 19 March 1813 Sir James was appointed commodore and commander-in-chief on the lakes of Canada. Prior to this date he had never commanded a capital ship, much less a squadron, but in his new assignment he was strictly enjoined never to undertake operations without “the full concurrence and approbation” of Sir George Prevost, the captain-general and governor-in-chief of British North America. 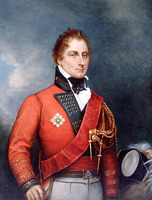 Moreover, he would speedily discover that in the Canadas his instinct for daring initiatives had to be disciplined in the interests of an imperious necessity: maintenance of control over Lake Ontario, the crucial link between the arsenal and dockyard at Kingston, Upper Canada, and the British force on the Niagara peninsula. Yeo and his immediate command of 437 officers and other ranks disembarked at Quebec on 5 May. The next day he was en route to Upper Canada, spurred by the news that York (Toronto) had fallen to the Americans on 27 April, and that this disaster had also cost the British the cutter Duke of Gloucester and a warship burned on the stocks to prevent its capture. He reached Kingston with Prevost on 15 May and within a fortnight had deployed his men and readied his ships for action. He had at his disposal the newly launched 23-gun Wolfe, the 22-gun Royal George, the 16-gun Prince Regent, the 14-gun brig Earl of Moira, two 8-gun schooners, and a number of gunboats. Against him the Americans could muster only the 24-gun Madison, the 16-gun Oneida, and some ten schooners bought after the outbreak of war and hastily armed with long guns. For the time being Yeo was unquestionably superior, but his squadron was seriously understrength in men and his prime weapon was the 32-pounder carronade, lethal in close combat but of limited range. The Americans, in contrast, had ample manpower, and were equipped with the long 24-pounder gun, which gave them a distinct advantage at a distance. Haste in Yeo’s preparations was essential since Prevost hoped to take advantage of the presence of the enemy squadron at the other end of the lake to effect a strike against Sackets Harbor, N.Y., the principal American naval base on Lake Ontario. The operation was intended to relieve pressure by sea and land on Brigadier-General John Vincent*’s force on the Niagara peninsula and, if possible, to destroy both the American dockyard and a ship under construction which threatened to outgun any vessel available to the British. It was duly mounted on 28–29 May but because of adverse weather and Prevost’s excessive caution proved a failure. The British effected considerable damage but suffered many casualties, and although the American squadron hastened to return on receiving news of the attack, its sailing came too late to benefit Vincent. Yeo, however, held effective control of the lake and rendered valuable assistance to the army until 23 July, when his opponent Commodore Isaac Chauncey sailed from Sackets Harbor with a powerful squadron led by his new ship, the 28-gun General Pike. For the next two weeks the two commanders manœuvred inconclusiveleo won a modest victory on 10 August but on 28 September, in an engagement known as the “Burlington Races,” he felt obliged to break contact and beat for Kingston. In the mean time, his squadron on Lake Erie, commanded by Robert Heriot Barclay*, had been destroyed on 10 September at Put-In-Bay, Ohio, by Oliver Hazard Perry. The campaign of 1813 had been intensely frustrating to both commanders: Chauncey, superior in long guns, had failed to find or create an opportunity to use them decisively, while Yeo had consistently lacked the favourable winds which would have enabled him to make effective use of his powerful but short-range carronades. Yeo’s reaction was to devote the winter of 1813–14 to rearmament and the building of more powerful ships. In both endeavours he was at a decided disadvantage: parallel American efforts were favoured by secure internal communications, but British supplies, equipment, and reinforcements could reach Kingston only via the exposed route of the St Lawrence. In the event, however, Sir James was able to leave Kingston on 3 May 1814 with a heavily armed squadron, now reinforced by two powerful frigates, the 56-gun Prince Regent and the 42-gun Princess Charlotte. With this force he was still superior in carronades, and could oppose 87 long guns to Chauncey’s reputed 61. Moreover, he had on the stocks a 112-gun ship which, as the St Lawrence, would become the strongest warship ever launched in the Canadas. On the 6th he cooperated with Lieutenant-General George Gordon Drummond*, the army commander in Upper Canada, in a highly successful attack on the American base at Oswego, N.Y., and on the 9th he blockaded Sackets Harbor. He raised the blockade on 6 June to return to Kingston but remained in control of the lake until 9 August, when Chauncey appeared off the town with his new frigate Superior, mounting 32 long guns and 30 42-pounder carronades. Since he also had a new 42-gun frigate, the Mohawk, his effective strength was appreciably greater than Yeo’s. The American squadron withdrew on 1 September, but Sir James remained in port, unwilling to risk his squadron on open water pending completion of the St Lawrence. This great ship had become the subject of acute concern in command circles. It had absorbed the total resources of the Kingston dockyard for months, and by the time it was launched early in September Drummond’s army on the Niagara peninsula was desperately in need of supplies and reinforcements. A further five weeks were required for outfitting but on 15 October the St Lawrence sailed for the Head of the Lake (the vicinity of present-day Hamilton Harbour) accompanied by an armada of support and supply ships. Thereafter Chauncey remained discreetly at Sackets Harbor. He had little choice: no two of his largest ships could have withstood the 112 guns – 68 of which were long 24- and 32-pounders – of Yeo’s new flagship. On 11 September Yeo’s deputy at Île aux Noix, Lower Canada, Captain George Downie, had lost both his life and his squadron at the battle of Lake Champlain during Prevost’s attempt to invade the United States from Montreal. This disaster was the second suffered by Sir James’s command, but in both cases his subordinates had been forced into premature action by army commanders of superior rank: Barclay on Lake Erie by Major-General Henry Procter*, and Downie on Lake Champlain by Prevost himself. The last was especially culpable. He was fully aware that Downie’s new ship the Confiance was not ready for action, and he withheld promised army support at the critical stage of the battle. Hitherto relations between Yeo and Prevost had been distant but correct. 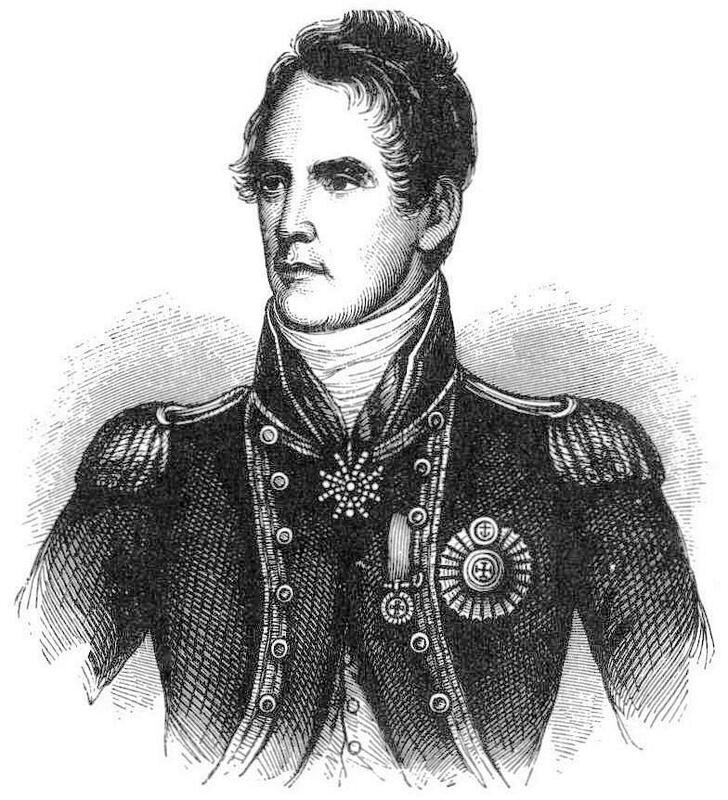 The commodore had been antagonized by his commander-in-chief’s caution and vacillation at Sackets Harbor, and since then he had had reason to resent demands that he support the army, requests which he considered unrealistic in terms of the safety and capability of his Lake Ontario squadron. But the war was still raging, and Yeo limited his formal reaction to the Lake Champlain disaster to a report addressed to the Admiralty on 29 September which clearly implicated Prevost as the author of Downie’s tragedy. It is unlikely that this report had any direct effect on Prevost’s future. By the time it reached London the secretary of state for War and the Colonies had apparently already decided to recall him. The inland naval campaign of 1814 ended on 21 November. Once again Yeo devoted the comparative peace of winter to reinforcing his squadron. During his 19 months in the Canadas the shipbuilding war with the Americans had accelerated to an extraordinary degree, and his plans for 1815 were appropriately bold and ambitious. The 56-gun frigate Psyche was launched at the end of December, and before the end of January he had two 110-gun ships on the stocks. The Psyche never saw service, and the other ships were never completed, since on 1 March 1815 Prevost received notice of the ratification of the Anglo-American peace signed at Ghent (Belgium) on 24 Dec. 1814. On the following day the commander-in-chief was informed that his appointment had been cancelled and that he was to report to London to account for his conduct of the Plattsburgh campaign. Sir James was also summoned home immediately, but he had no reason for concern, whether for his reputation or for his professional future. His health, however, was precarious: he was suffering from overwork and from the debilitating effects of the marsh fever peculiar to Kingston. He was succeeded by Commodore Sir Edward Campbell Rich Owen on 20 March 1815, and shortly thereafter embarked for England. He arrived in the United Kingdom on 16 May, and on the 30th addressed a lengthy report to the Admiralty on his experiences in the Canadas. In his opinion, British successes in this sector had been conditioned to an unusual degree by the “stupidity” of the enemy, which was particularly demonstrated by the American failure to cut the vulnerable line of the St Lawrence. 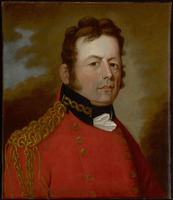 He did not think that this fundamental error would be repeated or that the British could hold the Upper Lakes in any future conflict, and forcefully recommended that Kingston be transformed into a major fortress linked to Montreal by an inland waterway along the Ottawa and Rideau river systems. 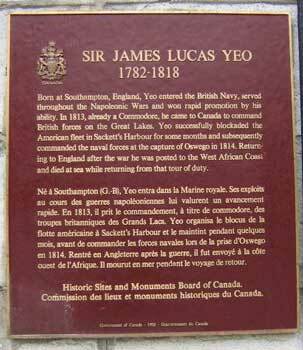 On 5 June 1815 Yeo was appointed commander-in-chief on the west coast of Africa with special responsibility for the anti-slavery patrol, a congenial posting since he was a convinced abolitionist. He was to fly his broad pennant in the Inconstant. It is a measure of his standing with the Admiralty that he received this position: by midsummer 1815 the navy was being rapidly demobilized, and scores of post-captains and other senior officers were being placed on half pay. He was not able to leave England for several weeks after his appointment, since he was required to testify at the court martial in mid August of those of his officers who had survived the battle of Lake Champlain. In the event all were honourably acquitted, responsibility for the disaster having been placed with Prevost. Yeo’s African assignment proved to be his last. He died, aged 35, “of general debility” on board the Semiramis, to which he had transferred in October 1817 while en route from Jamaica to England. His burial took place with full service honours at the Royal Garrison Chapel in Portsmouth on 8 Sept. 1818. He was survived by his parents, sisters, and his only brother, Lieutenant George Cosby Yeo, who was killed in a shipboard accident in the spring of 1819. James Lucas Yeo was a brilliant officer whose selfless devotion to duty contributed in large measure to his early death. He deserved well of his country, and he has justly earned an honoured place among the heroes of the War of 1812. PRO, ADM 1/2736–38 (mfm. at PAC). William James, A full and correct account of the military occurrences of the late war between Great Britain and the United States of America . . . (2v., London, 1818). 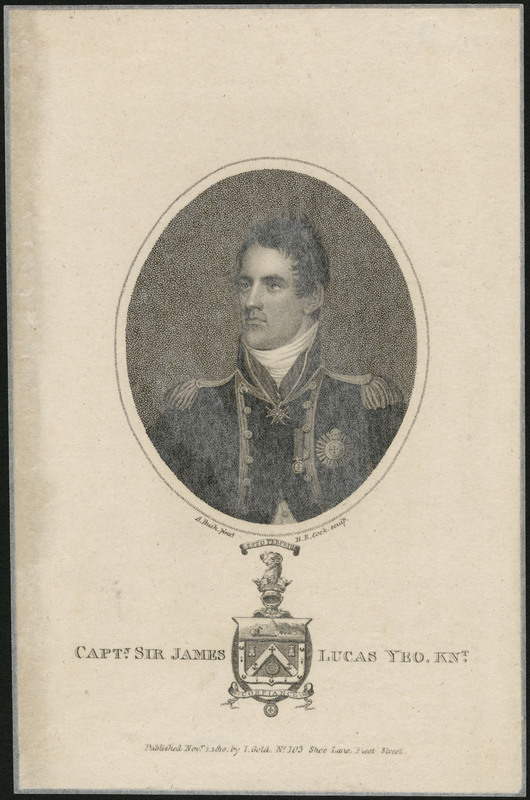 “Memoir of the public services of Sir James Lucas Yeo, knt., captain in the Royal Navy,” Naval Chronicle, 24 (July-December 1810): 265–85 (includes a portrait); Naval Chronicle, 40 (July–December 1818): 243–44. Select British docs. of War of 1812 (Wood), vol.2; vol.3, pt.1. Kingston Gazette, 1813–15. Colledge, Ships of Royal Navy, vol.1. DNB. H. J. Morgan, Sketches of celebrated Canadians and persons connected with Canada, from the earliest period in the history of the province down to the present time (Quebec and London, 1862; repr. Montreal, 1865), 221–22. W. L. Clowes, The Royal Navy: a history from the earliest times to the present (7v., London, 1897–1903), 5. Hitsman, Incredible War of 1812. A. T. Mahan, Sea power in its relations to the War of 1812 (2v., Boston, 1905). Theodore Roosevelt, The naval war of 1812, or the history of the United States Navy during the last war with Great Britain, to which is appended an account of the battle of New Orleans (New York and London, 1882), esp. 251, 355, 367. E. A. Cruikshank, “The contest for the command of Lake Ontario in 1812 and 1813,” RSC Trans., 3rd ser., 10 (1916), sect.ii: 161–223; “The contest for the command of Lake Ontario in 1814,” OH, 21 (1924): 99–159. C. P. Stacey, “The ships of the British squadron on Lake Ontario, 1812–14,” CHR, 34 (1953): 311–23. C. Winton-Clare [R. C. Anderson], “A shipbuilder’s war,” Mariner’s Mirror (Cambridge, Eng. ), 29 (1943): 139–48; repr. in The defended border: Upper Canada and the War of 1812, ed. Morris Zaslow and W. B. Turner (Toronto, 1964), 165–73. John W. Spurr, “YEO, Sir JAMES LUCAS,” in Dictionary of Canadian Biography, vol. 5, University of Toronto/Université Laval, 2003–, accessed April 26, 2019, http://www.biographi.ca/en/bio/yeo_james_lucas_5E.html.